We are thrilled to introduce our new Reference Guide App! This app combines information from the authoritative Reference Guide for Essential Oils, written by Connie and Alan Higley, with convenient search and note-taking features. Use the app anytime, anywhere to quickly find and confidently use recommended essential oils and oil blends for hundreds of different health and wellness conditions. This app is now available in the Google Play Store and in the iTunes Store. This app features 6 different sections—Personal Usage Guide, Application, Single Oils, Oil Blends, Notes, and Store. The first four sections have been condensed from the Reference Guide for Essential Oils to provide you with the most used information needed on the go. The Notes section allows you to view the notes you have made throughout the app. The Store button will lead you to AbundantHealth4u.com so you have quick access to purchase the essential oil–related accessories you need! 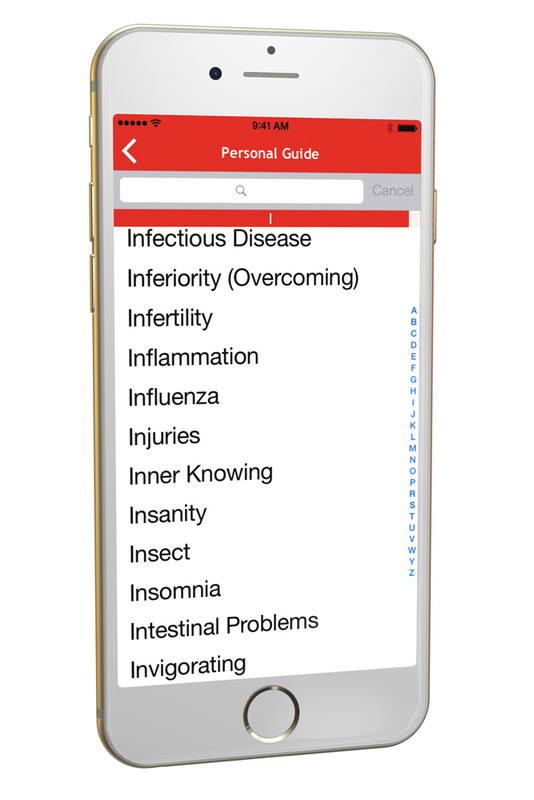 When you go into the Personal Guide section, you will see a list of over 700 conditions in alphabetical order. Just scroll through until you find the condition you are looking for! You can also use the alphabet displayed on the right to jump to different sections within this guide. If you know what condition you are looking for, you can quickly find it by using the search bar at the top of the screen. When you click on one of these conditions, you will find a brief explanation of the condition as well as the recommended oils. The oils in green are the most effective for that condition, and the oils in purple are secondary recommendations. Included in this app is the ability to take notes. While you are viewing a condition, single oil, or oil blend, you can simply click the “Notes” icon at the bottom of the screen and start typing. To view all of your notes together, just go to the Notes section from the main screen. Once in the Notes section of the app, you can view your notes according to the section you typed them in. 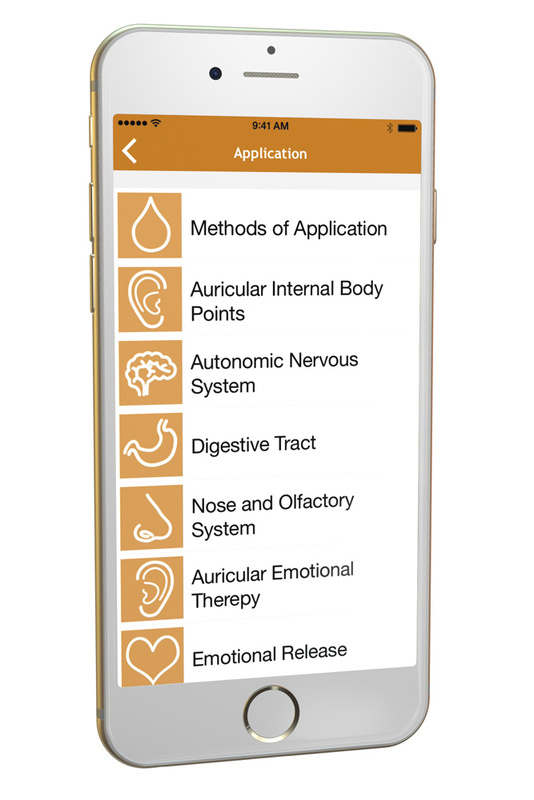 The “Application” button will take you to a series of pages providing basic information about the topical, aromatic, and internal applications of essential oils. This section contains some information provided in the Science & Application section of the Reference Guide. You will find concise information about application methods, body systems, auricular therapy, reflex therapy, and emotional release as well as charts and diagrams featuring these topics. Learn more about single essential oils and essential oil blends and their common uses. 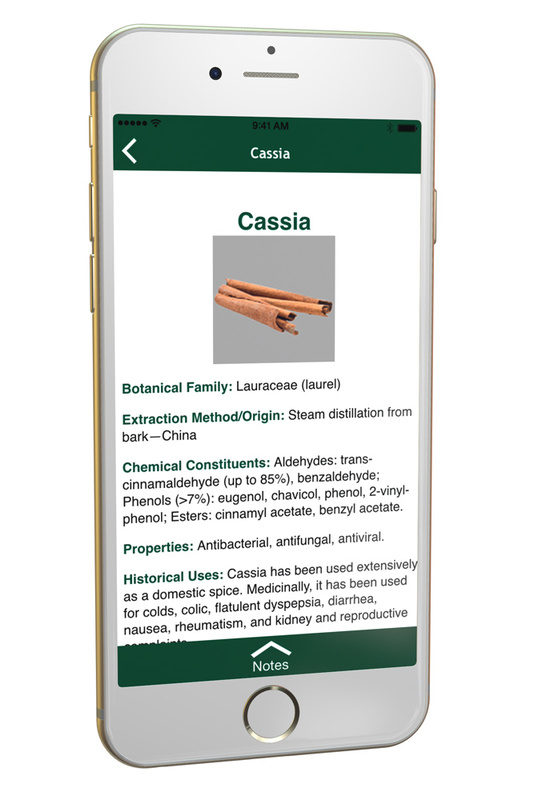 This app features over 100 single oils and 90 essential oil blends with information extracted from Reference Guide for Essential Oils–Botanical Family, Extraction Method/Origin, Chemical Constituents, Historical Uses, Common Uses, etc. 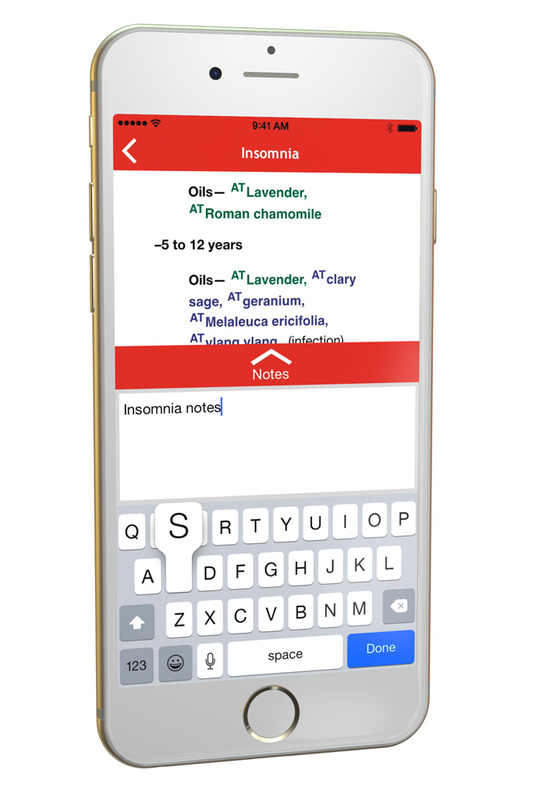 If you use an essential oil for something not listed in the app or have your own blend, just tap on the “Notes” icon at the bottom of the screen, and write it down. You can access these notes along with your other notes in the notes section of the app. Where do I go to purchase the Reference Guide App? Download the app today from iTunes or the App Store for Apple devices or from the Google Play Store for Android devices. Do I need access to the internet to use this app? 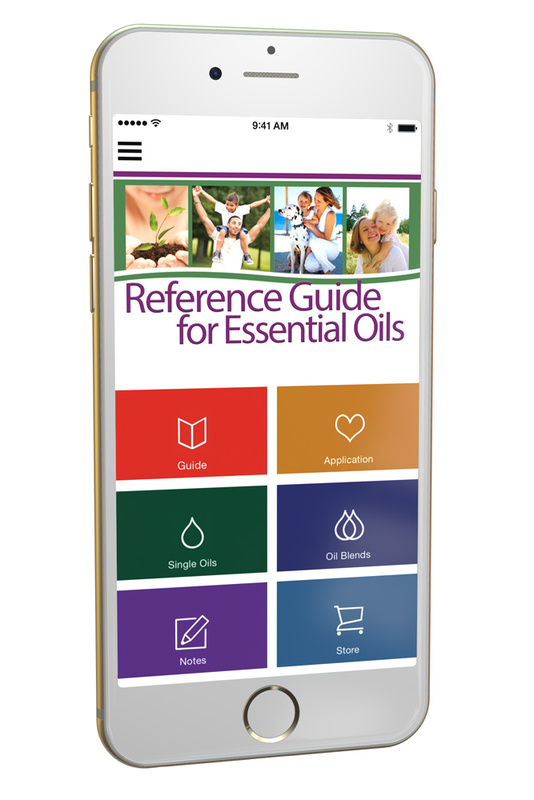 You will need internet to download the app and to use the “Store” button, but you do not need an internet connection to view the Personal Guide, Application, Single Oils, Oil Blends, or Notes sections. Will I need to purchase updates for newer versions? No. At this time, we are providing the updates for free. Will this app work on a Kindle, Nook, or Windows phone? No. Currently, we do not have versions for the Kindle, Nook, or Windows phone. Does the app contain all the information provided in the Reference Guide for Essential Oils? No, the app does not contain all the information in the Reference Guide. The Reference Guide has 6 sections: Science and Application, Single Oils, Oil Blends, Personal Care Products, Supplements, New Products, and the Personal Guide. Out of these sections, the app has a condensed part of the application section, the full single oils section, oil blends section, and the personal guide section. The app is designed to accompany the book as a quick on-the-go reference, but we still recommend having the book at home to reference the rest of the information. Can I get this app in a different language? Not currently; however, we hope to provide this app in various languages in the future. I had this app for over a year on my ipad but deleted it from my iPad. Now it is not available for me to re-download. Do I really have to pay for it again? Hi Alexis! Please contact our customer service team for help resolving this problem. You can reach them at 801-798-0642, or [email protected]. They should be able to answer your questions and fix this problem. I have this already installed from quite some time ago. You indicated updates are ‘free’. Do I need to uninstall it, then reinstall to get an updated version? When I look for the reference guide at the Google Play Store, it says it costs $.99, and my Android says it’s already installed. Help? Your phone typically updates automatically through the app store, or you will get an alert through the app store to update it. You do not have to re-install the app to get the updates. Hopefully this helps! If you are still experiencing difficulty, you can contact our customer service team by calling 801-798-0642. Thank you! I just read about possible solutions for hiccups an hour ago. I use it all the time and want to keep it updated. Will this be available for Google pixel XL?thats the phone I have and it’s not compatible for this version. We have been working on updating the app, but the process is taking longer than we had hoped. The new app will be compatible with the Google Pixel XL, but I can’t give you a specific time as to when it will be completed. I have the Google Pixel 2 and had this app before but it became incompatible. I was super disappointed as I had paid for it and none of the other apps are as good as that one. Hope it becomes compatible again soon! I have the Android 9 software now and have found that some apps aren’t compatible with that yet either. I bought the app for my iPhone. Can I download the app on my Mac? I really don’t want to pay for it again. Unfortunately, the app is only available for phones and tablets. We do not have a version compatible for a Mac at this point. If you want to use it on an iPad, you wouldn’t need to purchase the app again. I love this app! I have a new phone running Android 8.0 and can’t get this app anymore. I rely on this app for much of my oil consulting. Please update the app so I can continue using this awesome oil reference! Oh no! We’re sorry to hear that! We are working on updating the app and hopefully it will be done soon. I’ll let our app developers know that you were having an issue running it on Android 8.0 so they can look into that specifically. My app seems to have frozen up with the header page in front of the other pages hidden behind it. How can I reset the app or get it out of the freeze frame? Brenda, thanks for letting us know you are having this issue. I haven’t heard of it happening before so I’m not sure how to troubleshoot it, but I’ll pass it along to our app developers and see if it is something they need to fix. The Guide part of the app, say sinuses, includes a list of oils that could help with sinus issues. This list of oils is written in two colors, what does each color mean? I understand the “T” and the “A” but why the different colors? Linda, the primary essential oil recommendations are listed in purple and the secondary essential oil recommendations are listed in green. When choosing oils, try the oils listed in purple first (unless you don’t have them or if they should be avoided for your body), then try the oils listed in green. Than you for clarifying. I thought it was the other way around (primary = green; secondary = purple). I love this app so much. It has been very helpful to me. Oh no! I explained it wrong. The PRIMARY recommendations are in GREEN and the secondary recommendations are in purple. Sorry to make that even more confusing. Primary recommendations are always listed first and in order of most beneficial based on their chemical constituents and properties. Hmm. Thank you for letting us know about this issue, Astrid. I let our app developers know of this problem. Hopefully, we can get it fixed right away! I have the app and love it, however can you clarify why the oils are in different colors when looking up a symptom? Some are green, some blue. I thought it represented topical or Aromatic but they all have a T next to them or TA. Having this explained in the app would be very helpful. Under the Personal Guide section, the oils in green are the most effective for that condition, and the oils in purple are secondary recommendations. I’ll let our app designers know that there is some confusion on the different colors and suggest they include an explanation in the app. Thanks for the feedback, Amanda! What is the difference between TA and AT? Some oils just have a T. I assume that’s topically. And some have only A. I assume that is aromatic. But I can’t figure out why some say AT and others TA? The T stands for topical application and the A stands for aromatic application. The TA or AT just shows which application method is most effective when both methods are options. Thank you for clarifying. It was driving me crazy not knowing the difference between the two colors. Good suggestion Amanda. I am new to all of this and I am still not sure what the I refers to. I believe it stands for ‘Internally’ as in a gelatin capsule or mixed with honey, food or beverage. Yes, that’s correct! “I” stands for internal use. You can take the oil internally by capsule, in food, in a beverage, etc.